A prolific draftsman, van Gogh considered drawing to be the foundation of his art. Yet only in his work at The Hague and at Nuenen in the Netherlands, where he worked periodically in the early to mid-1880s, did he attach importance to sketching directly from the model. 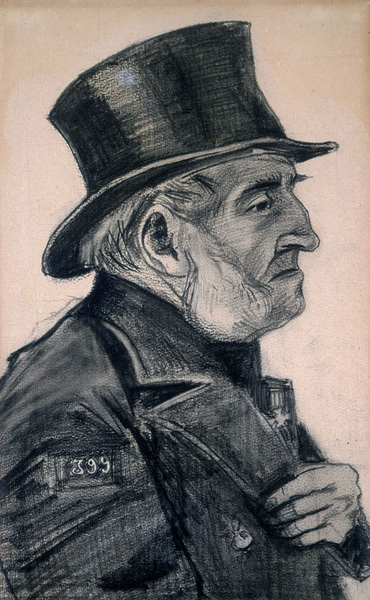 This image of an elderly man in a top hat is one of numerous studies of men from a workhouse in The Hague who posed for van Gogh in their everyday wear and in their Sunday best. The same man appears from a variety of angles in many drawings. Here the subject is shown sporting a decoration on the left lapel of his overcoat and a badge bearing the numerals 399 on his right sleeve. The man's fragile dignity is suggested by his frail hand tugging at his coat and by his worn top hat. Van Gogh seems to have been attracted by the forceful physiognomy with outsize ears, ample whiskers, emphatically curving and pointed nose, and wizened mouth. Executed only two years after the artist had launched his career, this drawing reveals both his masterly touch and his human sympathies; the strong, nervous strokes on coarsely textured paper aptly convey the harshness of the poor man's existence.